Ask many business owners about ‘online reviews’ and they will shudder – some are even positively paranoid about receiving a less than favourable review from a disgruntled client. When we advise that it is good practice to publish and actively encourage online reviews there is usually a short silence, then a look of absolute shock! For customers though, online reviews are one of the biggest factors in helping them to choose a product or service. Businesses who ignore this fact are about to lose out in 2018 as Google ramps up its algorithms to reward well-reviewed businesses with higher search engine rankings. The most widely used search engine, Google, shows review ratings in search results from various sources and platforms. Check this search result for the term ‘band backdrops’ and note how the top result has reviews showing, whilst competing pages do not. By far the most widely used search engine in the English speaking world, Google encourages businesses to garner reviews through Google’s own review platform. Simply search for any business in Google Maps and you will see it’s reviews (if any) with a star rating out of 5. Google makes it easy to leave a review. Again, the top result here is showing real reviews whilst competitors do not. 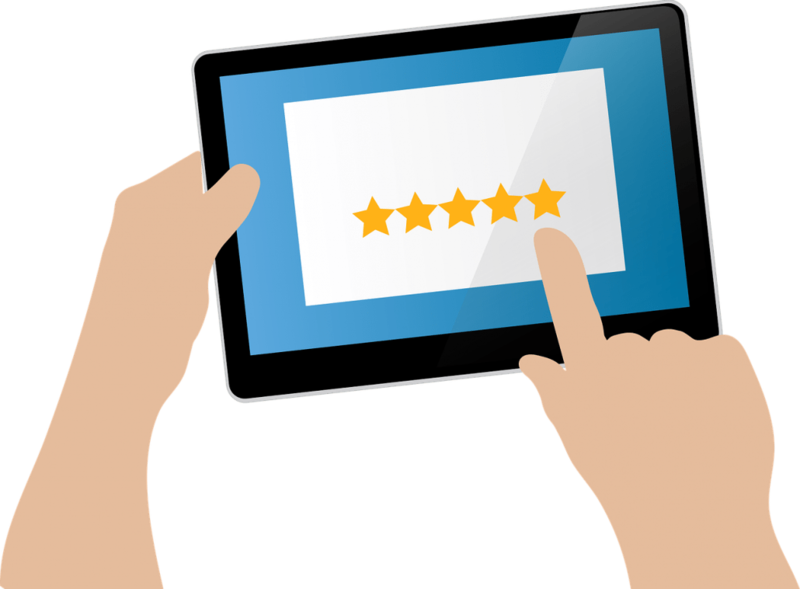 Google also provides a reviews system for e-commerce websites, allowing customers to leave reviews on individual products. You need to make sure that your business is showing correctly on Google Maps in order to receive reviews. Your Facebook Business Page can easily be set up to encourage reviews. These are also picked up by Google search. Yell, although not as widely used these days, also has its own reviews platform which is fed through to Google. Setting up a basic Yell listing is free. A must for hotels, guest houses, pubs. restaurants and tourist locations. Setup is free. Research from the highly respected Pew Research Center concluded that 82% of adults read online reviews before making a purchase, with those under 50 especially likely to incorporate reviews into their decision-making process. When presented with search results, consumers will be more likely to click on pages that show real review ratings. Positive reviews help consumers to trust a business more. Customer reviews let a business know exactly where it is succeeding – or failing. Areas of improvement can quickly reveal themselves, allowing the business to react quickly. Live review feeds from Google, Facebook, Tripadvisor and other platforms can easily be placed on your website using our core skills. Every new website we do now includes live feeds of reviews from the main relevant sources. Many business websites may show testimonials, inputted by the business owner or their web developer. These are OK, but do not show up in Google search and are not regarded as trusted or verified. Our bespoke review system for your website puts you in control by encouraging customer reviews and then giving you the final say on approval. These reviews feedback through to Google and help your search engine rankings. We build this into all our sites as standard and it is only available on websites that we host. Most informative. I have been wondering why some of our competition had star ratings in search. Will be in touch. Google Algorithm Changes – Could these affect your search ranking? Are Online Directories Any Use For SEO?